Would you like to treat a child to a birthday with a difference? Allow Heureka’s inspirers and our Science Restaurant to help out with the birthday planning. We offer an experience for all that’s active, imaginative – and tasty. You can choose either our super-popular Birthday Chemistry package or a Heureka birthday. The Birthday Chemistry package includes colourful and fun chemistry experiments related to birthdays. The birthday package includes delicious offerings in the restaurant, as well as an unguided exploration of Heureka’s exhibitions and films in the planetarium. As well as delicious birthday fare, Heureka birthdays include entry to Heureka’s exhibitions and planetarium films. The party table in the Science restaurant will be decorated with colourful streamers and balloons. It’s a good idea to reserve at least two to three hours for the birthday celebration. The whole birthday group is welcome to see the exhibitions either before or after the scheduled birthday activities. Heureka is normally open on weekends from 10 am to 6 pm. You can check irregular opening hours from here. Exhibition tickets are valid for the whole day. The Heureka ticket includes entrance to all of Heureka exhibitions, to the planetarium films and to programmes that are open to the public. You can check the daily programmes from here. To make sure you get the time that suits you best, we recommend booking the birthday package well in advance. Please note: Both of the birthday packages are for a minimum of six persons. The renewed Birthday Chemistry programme features making a birthday cake in science-centre style! The children will create a glow-in-the-dark birthday cake which generates clouds. They will also create soap bubbles in a new way. The birthday package also includes delicious offerings in the restaurant, as well as independent exploration of Heureka’s exhibitions and films in the planetarium. The Birthday Chemistry packages are very popular, so please make your reservation inquiry at least two months in advance! Heureka birthdays are suitable for children of all ages, and for the young at heart. 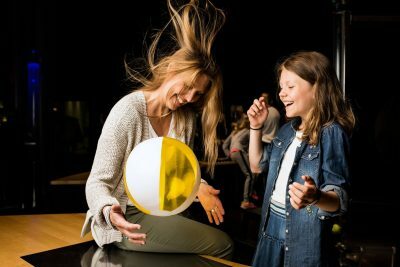 The birthday celebration package includes a fun day at the science centre, enjoying the exhibits and the planetarium. On some weekends, Heureka also has special programmes, such as science theatre shows and walk-in laboratory programmes for families. You can check the daily programmes from here. Heureka’s birthdays also include delicious birthday servings. The party table in the Science Restaurant will have plenty to eat and drink, and will be decorated with colourful streamers and balloons. When booking Heureka birthdays, please note that the time you choose is the time at which the birthday party food and drinks are served. The whole birthday group is welcome to see the exhibitions either before or after the scheduled birthday activities. Heureka’s birthdays can be booked for Saturdays or Sundays from 11 am to 4 pm. The serving of food and drink lasts about half an hour, and always start on the hour. You can choose the time that’s best for you from our booking calendar. To make sure you get the time that suits you best, we recommend booking the birthday package well in advance. Birthdays are paid for at the ticket office in Heureka. Reservations that are cancelled at least one week before the reserved date will not be charged for. For cancellations later than that, 20% of the total price will be charged. The responsibility for supervising the birthday group lies with the parents, guardians or other adults accompanying the group. You can choose the most suitable time from our booking calendar. Once your reservation is made, a confirmation message will be sent to the email address you have provided. The party table in the Science restaurant will be decorated with colourful streamers and balloons. Children will be served mouth-watering decorated ice cream cake, and juice. The cake is lactose-free and gluten-free, but may contain traces of nuts. The birthday package includes coffee for two adults. You can also order other treats for the party, such as crushed ice slush drinks, doughnuts or marshmallows. These must be ordered in advance. In case of allergies or any inquiries about optional extras, please contact the Science Restaurant, either by phone at +358 (0)9 857 9399 or email ravintola@heureka.fi. We kindly ask that you inform us of any special dietary needs by email three working days before the party. 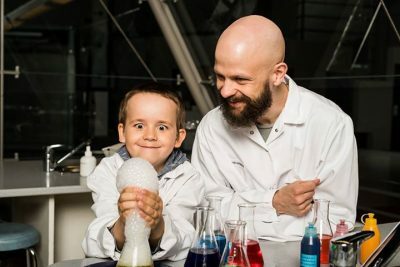 Birthday Chemistry parties cost 29 EUR per child (for a minimum of 6 children). Entry to Heureka is free for one adult per ten children. Our restaurant serves coffee for two adults. Heureka birthdays cost 23.50 EUR per child (for a minimum of 6 children). Entry to Heureka is free for one adult per ten children. Our restaurant serves coffee for two adults.